Compared to every other room in a home, the kitchen is arguably the most popular spot to gather with friends and family. 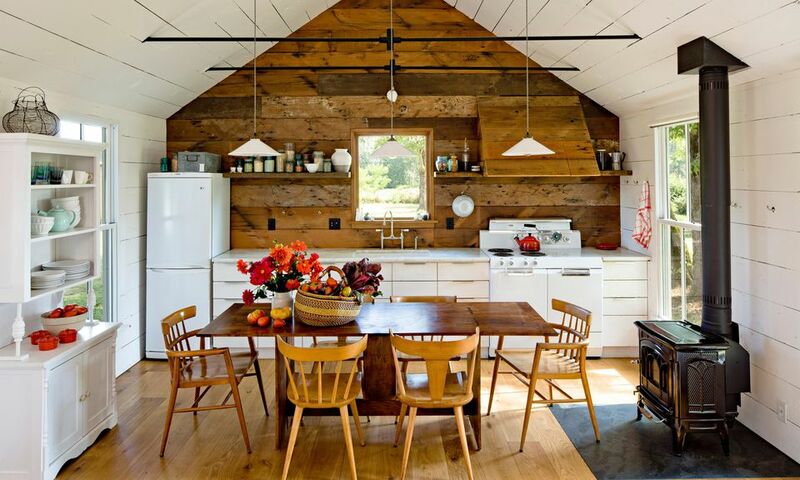 And these days rustic cooking spaces brimming with country charm are even more irresistible. But how do you go about adding this coveted style to your existing area? Luckily, the country kitchen concept is very malleable — it can feel clean and minimal, retro and colorful, or elegantly traditional. You get to decide how countrified to go. Let these beautiful examples whet your appetite for creating a practical and beautiful rustic-inspired kitchen. There are many affordable country goodies in this rustic kitchen by Sarah Joy, a home décor blogger. A porcelain apron front sink is a country kitchen must-have. The curtain covered cabinet is 100 percent farmhouse. We love the white beadboard backsplash — it is a countrified and less expensive alternative to white subway tile. If you prefer thicker planks of wood consider shiplap. Another fantastic trick worth stealing is using an old exterior door to conceal the pantry. Notice the white walls? Sarah went with a warm shade that coordinates beautifully with the butcher block countertops and hardwood floors. Bold, bright colors enliven in this polished country kitchen by California based interior designer, Alison Kandler. A vintage screen door from an old farmhouse says hello in mustard yellow. Two-tone cabinetry and white walls draw the eyes around the room making the cooking space seem bigger and airy. Vintage accents including a metal fruit stand and orange shutter take the modern edge off the white quartz countertops. A kitchen island covered with reclaimed wood, raw beams on the ceiling, and oodles of colorful accents lend country charm to this apartment kitchen by London based Avocado Sweets Interior Design. Another great feature worth mentioning is the durable concrete floor, which can work in all types of spaces from rustic to modern. Several affordable updates by Alys Design out of Pittsboro, North Carolina, give this white kitchen a splash of country. The white cabinets with black hardware are original to the home — they were refreshed to provide the cooking space with a lived-in look that feels both rustic and relaxed. A vibrant shade of red may be the ultimate country color. Here a red vintage apple sign, a flea market find, personalizes the space. Reclaimed wood shelving provides practical storage while being in step with modern farmhouse style. Simple, shaker style cabinets are perfect for country-inspired kitchens as shown in this red and white cooking space by Pinneo Construction out of Princetown, New Jersey. The black and white checkered floor is a classic feature that lends old-timey flair. The farmhouse inspired beadboard kitchen island takes the industrial edge off the stainless steel oven hood. The barn red walls add a big dose of room warming color. Two-tone cabinetry anchor this bespoke country kitchen by Baker and Baker out of the U.K. The wood base cabinets bring a country cottage feel without being overly rustic. Above a crisp subway tile backsplash and robin's egg cabinetry add a refining modern farmhouse touch. Every home chef appreciates a large sink. Here a porcelain farmhouse sink adds beautiful function. The crowning jewel in this space is the vintage-inspired cast iron oven that would have been at home on the range. Alison Kandler Design combines white features with colorful accents to spice up this rural inspired kitchen. A modern farmhouse kitchen island in barn red sets the pastoral tone. Instead of ripping out the home's old wood floors it was given a vibrant and homey new appearance with paint. Pretty touches like the scalloped oven hood and furniture inspired cabinetry complete the kitchen's country cottage appearance. Another cool tip to consider is swapping out stainless steel appliances with colorful options in nature-inspired hues as robin's egg blue. Here is an example of an authentic country kitchen recently updated with modern features by Douglas R. Schotland Architect, out of Pennington, New Jersey. Cabinetry washed in blue color anchors the room with old-timey country style. Soapstone features including countertops and an apron front sink add function but unlike other types of stone materials such as marble, soapstone's rugged appearance enhances the kitchen's farmhouse vibe. Unpainted wood features are a big part of country kitchen style. Here gorgeous thick floorboards, an authentic farmhouse dining set, and a natural wood ceiling are all hallmarks of the country look. Nothing says country kitchen like beautiful handmade cabinetry and paneled walls made of rough-hewed wood. Here, River Birch Builders in Asheville, North Carolina constructed this entire space using reclaimed barn wood for a distinctly, rustic appearance. The rest of the features in the kitchen are modern. However, some items like the brand-new oil rubbed bronze sink and faucet set were both selected for their old-timey, country appearance. Another fabulous feature is the butcher block countertop protected by a watertight sealer. The wood surface is a beautiful alternative to more expensive materials such as stone that would not feel as warm in a country-inspired cooking space. A reclaimed wood feature wall puts the country in this rustic kitchen by Jessica Helgerson Interior Design based in Portland, Oregon. The sidewalls are covered in white shiplap, a modern farmhouse favorite. A large rustic dining table with mismatched wood chairs lend room welcoming charm. The vintage china cabinet on the left is the perfect place to display dishware and kitchen trinkets. There are many surefire country ingredients in this custom kitchen designed by Crownpoint out of New Hampshire. First, let's talk about illumination — three vintage farmhouse pendant lights in green function as task lighting. Then there's a three-inch thick maple, butcher block kitchen island. It is a homey touch that adds more visual warmth than a stone countertop. A collection of vintage wire egg baskets contribute old-time style that personalizes the space.